Bow and Arrow. 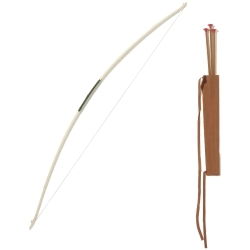 This set includes a 60" wooden bow and 3 arrows with suction cup tips. PLEASE NOTE: THESE REQUIRES SPECIAL SHIPPING AND ADDITIONAL SHIPPING FEE'S WILL APPLY. PLEASE CONTACT US TOLL FREE AT 877-218-1289 FOR A SHIPPING PRICE.